Last weekend was quite exciting, as a few members of 757 Labs built a project for Shmoocon. It was an audience feedback moose that took feedback via an internet website and visually (then audibly) responded. The eyes were BlinkM LEDs and the audio feedback was done by means of a Harbor Freight airhorn kit powered by ham radio power supplies. Of course, being a con project, it was a bit last minute. Planning and software started much earlier, but it's just how things go. One huge last minute issue was when a relay failed. 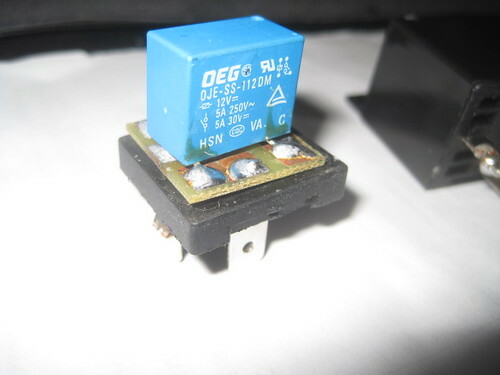 This relay was supplied with the Harbor Freight airhorn kit, and was used to switch the high current load of the compressor by means of the the microcontroller which was triggering the relay by means of a MOSFET. After only a few tests the relay seemed to fail. One would guess the transistor failed, given that it's a 40 amp automotive relay. This failure, however, seemed to echo some online comments about the air horn kit. Before heading to Radio Shack, I popped the top on one of the relays and low and behold, it's a lie. 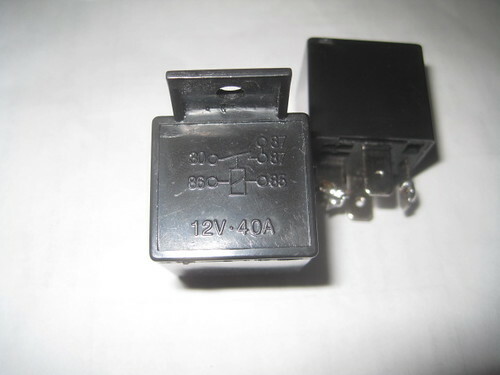 The 40 amp relay is really a fake case on a 5 amp relay. It was purposely made to look like it was a heavy duty 40 amp automotive relay, when it is not! I've heard about Chinese vendors doing this with capacitors, but never have witnessed it in real life. So here you have it, the 40 amp relay included with the Harbor Freight air horn kit is a lie. The fix was ultimately to go to Radio Shack and pick up some replacement relays. A few taxicabs and a few Radio Shacks later relays that looked pretty similar to the Harbor Freight ones were in hand, but the Radio Shack ones weighed quite a bit more. We had 3 of the air horn kits, and sourced 3 replacement relays. The air horns draw at least 20 amps, so there is no way the supplied 5 amp relay (mocked up to look like a 40 amp relay) would last very long. Relays after removal of cover. It's really a 5A PCB mount relay! Unfortunately this delayed the airhorns until mid-day Saturday, as the Radio Shack nearby in the city closed early. I wonder if Harbor Freight knows their supplier is lying to them? There will be people around the hackerspace working on projects this evening from 7pm till 11pm or later. Open to the public so feel free to drop in! 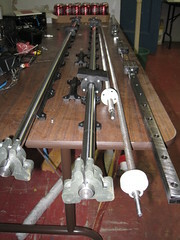 Some parts are on hand for building of the 60" x 35" x ?" CNC router! Still need wood, and some couplers, and all the other parts that we will find out we need once it's halfway done. 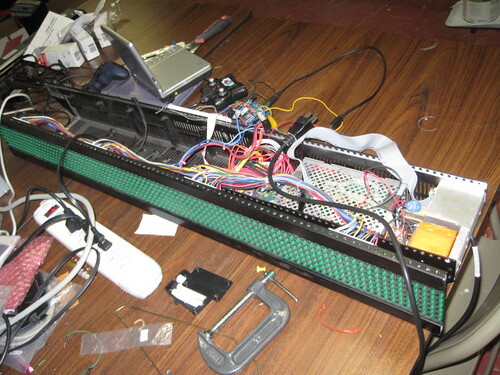 TJ continues to make progress in converting an older 12' long (7 pixels high) green LED signboard to run from an Ardunio (Atmel 328) instead of it's original controller. With the new controller the sign will act as a frame buffer off of a host computer, allowing it to act as a spectrum analyzer and other neat effects not possible with most LED signboards. Just a heads up, 757 Labs was featured in an article written by Matt Labarge, published on AltDaily! Check it out here!. Thanks to Alt Daily for the mention and Matt for the article! 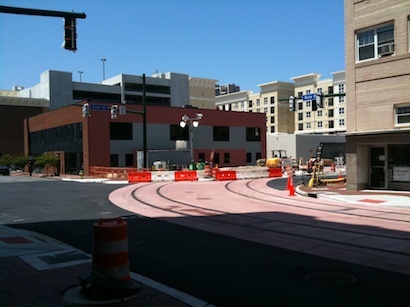 Light rail is still a ways off, but the construction in front of the lab is moving along nicely. The tracks pass by us, and are finished off. No sign of power yet, but the street is open in all directions at our intersection. Sure the prospect of car/train collision is high, but if we get a camera pointed at the most likely point of impact, perhaps we can offer the feed to HRT and VDOT for faster incident response?